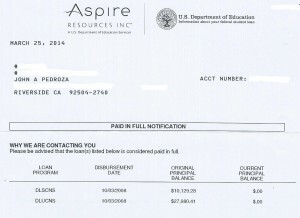 I have to say that in the past I was never a fan of any piece of mail from Aspire. Not that I blamed them or anything, I mean they were just doing their job, but every piece of mail I got from them was a constant reminder of this proverbial knife I had over my head. Unlike other forms of debt student loan debt never goes away, it always accrue interest, and it cannot be discharged by the court. After graduating in 2008 I cannot begin to explain how happy it mad me to get this letter. With this paid in full notification I now have no personal debts to anyone. Not saying I don’t owe anyone any personal gratitude, but I find the terms for paying back gratitude is usually easier than that of money debt (not to mention that is something you really can’t pay back). Well, it wasn’t easy. The first thing I had to do was assess my personal situation. Like many people this was not fun. To assess the situation I had to write out everything relating to me and money. It wasn’t fun, everyone likes to spend money, but I had no joy in being accountable for it. Then I had to talk to Denise about it. Being married means nothing is really just yours. There were some hard conversations. I knew that if we were ever to pay this off we were going to need to make some big sacrifices. All those money advise columns like to talk about if you just cut out that daily frappuccino from your budget you can afford anything. Maybe that works for some people but we are not coffee drinkers and even if we were we would never spend that much money on something like that. Discussing our finances came with a lot of tears but we got through it as a couple. 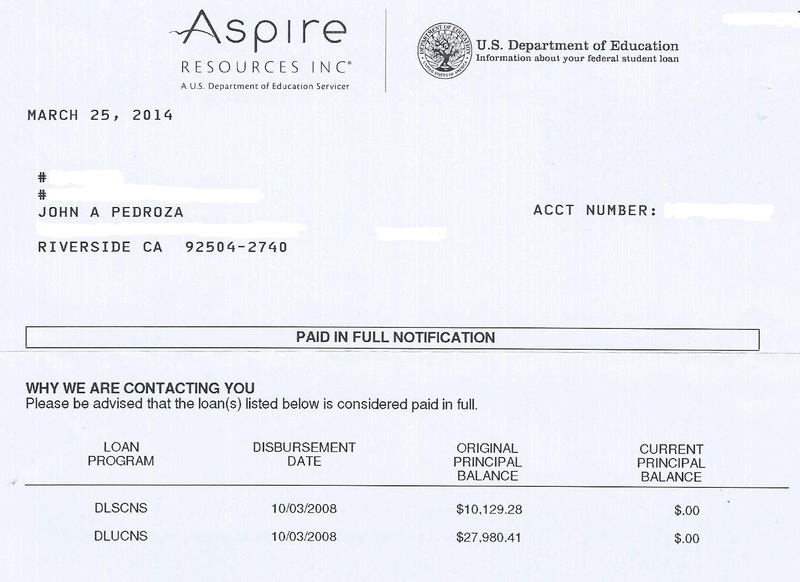 In the end we dedicated $500 a month for student loan payments. That was almost triple our minimum payment! That caused us to make serious quality of life choices. We downsized majorly. We have one car which we use sparingly. After running the numbers we moved to closer to my work to take advantage of lower costs on the car and to take advantage of public transportation (which is not always cheaper but the key is we have options). We have a budget and every dollar is accounted for by the end of every month. We shop at the discount markets (which sometimes require use of a foreign language). In addition to the budget we invested. In addition to my regular job I make money in other ways. I registered my own private business, I sell on ebay, and I do other odd jobs on the internet. All the money I make from these extra sources I put into the stock market. I am not Warren Buffet, but I do my research and make a pretty good return (I have average over 30% in the last three years). It is all little stuff but it adds up. Day after day, month after month, year after year we have been doing this and it has all been piling up. Eventually one day I looked at the budget and I saw that if we used our savings and cashed out our stocks we could pay off the loan, so we did. Simple, we keep going. In making the last push to pay off the loan we dipped into our savings and had to cash out some stock options. Some would argue that would be a bad move based on opportunity costs lost to interest, but after running the numbers I found we would save more by paying off the loan early. In fact by my calculations we saved ourselves about $25,000 dollars by accelerating our loan payments. That is money we will be able to reinvest in ourselves. We have decided to pay back our savings at a rate of $400 a month, the difference being now all the interest earned comes to us and our monthly budget has a very good padding, because let’s face it, no one is ever 100% sure when it comes to finances.